I want to publish my book but I’m confused! Do I need an editor, a line editor or a proofreader? I was recently writing back to a prospective client who had got very confused about the different types of editing and proofreading and the process needed for publishing their book. I sent them some resources from this blog and thought it might be useful to share those here, too. So, here are some articles I’ve written about the different kinds of editing, the process of editing and proofreading (and where your beta readers fit in to that process) and how to make sure your editor and proofreader are, ahem, on the same page. 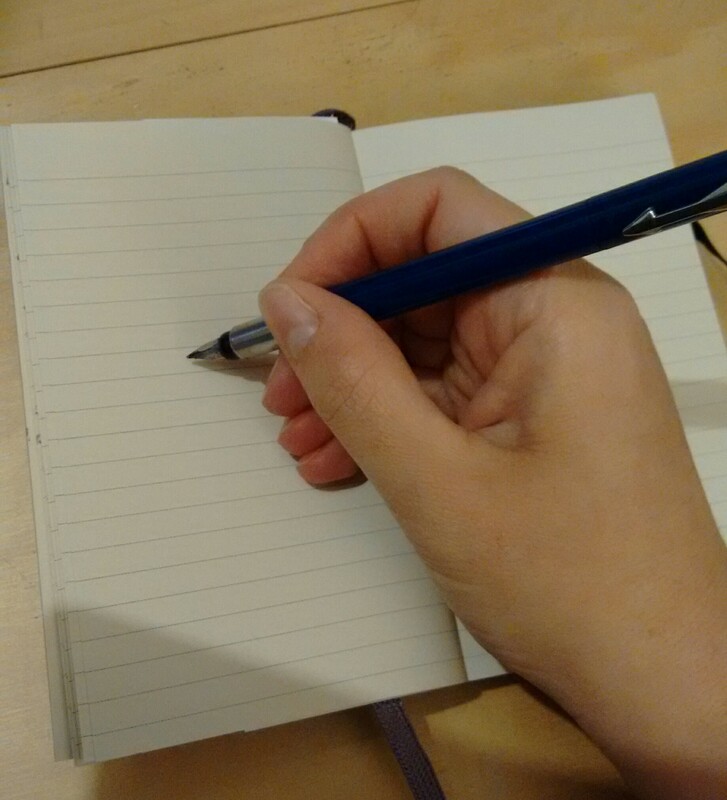 At the bottom are two articles I’ve written about how to deal with an editor – that can feel like an alarming process in itself, so hopefully I’ll reassure you there! I hope you’ve found this very quick guide to dealing with the complexities of getting your book edited and proofread, and how to deal with contacting an editor, useful. If you have, please share this article using the buttons below, or leave me a comment. Thank you! What’s an acceptable error rate for an editor? I have found this article from the marvellous industry journal copyediting.com considering acceptable error rates for editors extremely useful for sharing with clients and setting expectations. Although editors/proofreaders do tend to be perfectionists, we are human, and it’s good for us and our clients to remember this. If a piece is full of errors, even a 99% accurate editor will leave some errors behind. Read Adrienne Montgomerie’s article, “Error Rates in Copyediting” here. What do I actually do? What do you actually do? 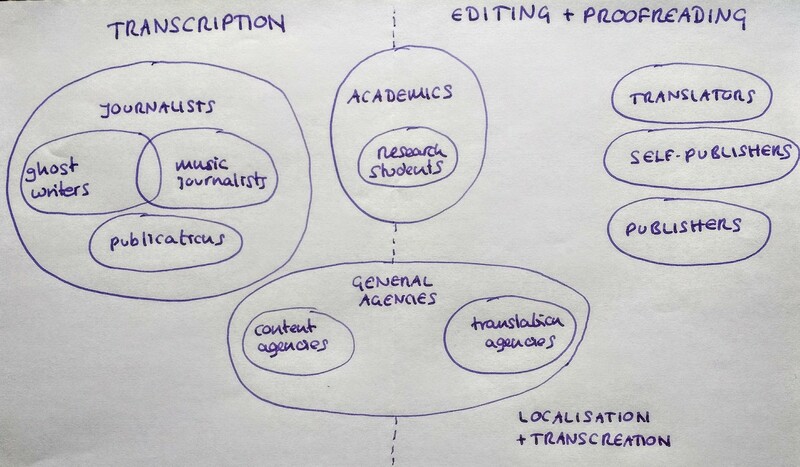 Who does an editor or transcriber work for? Taking a well-earned coffee break this week, my friend Jen challenged me to draw a Venn Diagram of what I actually do, for whom. I accepted the challenge. Especially if you have a portfolio business, where you offer more than one service, can you draw out your customer base and services? How many attempts do you have to make (four for me!)? Can you see any patterns? This article follows on from Working with an editor 1: How do I request a quote?, where I explained what an editor needs from a prospective client in order to give them a price and turnaround quotation. Now we’re going to look at where you go from there – what will the editor/proofreader send you, is it OK to ask for a sample edit, and how to proceed with negotiating and then – hopefully – booking an editor. What does a quote from an editor include? Your editor will usually quote you a price and a turnaround time. I work in a price per 1,000 words (different people do different things: I like my clients to know up front how much they’re going to pay) and will tell the prospect how much time I’ll take to do their work and when I can slot it into my schedule. So I might say something like “I can take on this project for £7.50 per 1,000 words, I’ll need 2 weeks to do the work and I would be able to start it on 1 May”. Be assured that a good editor will have thought very carefully about the pricing before they send it to you. I try to be as fair as I can to myself and the author, basing my price on the amount of work that the edit will involve. This is why most editors and proofreaders will offer a “from” price on their website if they have a price at all, as that’s a guide to the least it will cost (for something involving a very minimal amount of editing). Some editors offer discounts for students or self-publishers, so make sure you’ve explained if you’re one of those categories. In my opinion, the negotiations should be about dates and turnaround times, and about what you want your editor to do, not about price. I don’t offer a high price so that I can be beaten down to my “real” price, and I don’t know anyone who does. Their ability to match the style sheets of publishers, journals, etc. But within the negotiation, it’s fine to, for example, ask for a sample edit, or ask if the work can be done in a shorter time period (this may involve an urgent fee but your editor will explain that). Regarding time slots, it comes as a surprise to some people to discover that their editor / proofreader has other clients on the go. We have to keep booking in clients and rebooking regulars in order to have a constant stream of work and, basically, a continuous income. So if your editor really can’t start working with you until the week after next, there will be a good reason for that and they may not be able to move that commitment. However, do give them a chance and ask, just in case. Is it OK to ask for a sample edit? Some people are nervous about asking for a sample edit but most editors are happy to provide one. We usually limit it to about 1,000 words, which should show up any major issues that are going to come up in the job as a whole. I use Tracked Changes in word or marked-up PDF as appropriate, and I also send back a skeleton style sheet detailing the decisions I’ve made so far, so you can see how I work. It’s a good idea to send your sample text from the middle of the work in question. You will typically have gone over and over the start of your manuscript, but not paid so much attention to later sections. A section from the middle will offer a truer representation of the level of editing needed. This last point is really important. If I’m negotiating with a client on a job, I’ll be holding open a slot for that job for the time frame we’ve been discussing. It’s only fair to let me know if you don’t want to book my services, so I can accept another job in its place. Choosing an editor or proofreader is a whole topic in itself. You need to feel comfortable with them and they need to work in your subject area or genre. You might think I’m great, but however lovely I am, I’m just not going to be able to edit your horror novel! It’s fine to look at references (a good editor will have references or testimonials on their website) and to discuss how they would approach your book. It needs to be a good fit from both sides. If I don’t think I’m a good fit for you, I will usually be able to recommend on someone who will be more useful, but an editor’s ability to do this does rely on the networks they’re in. 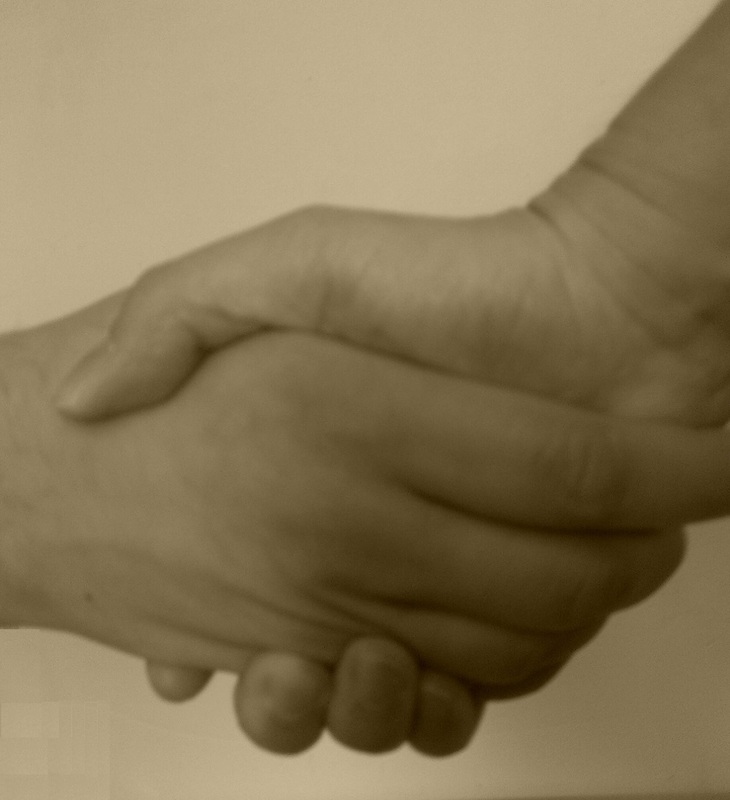 Signing a contract or accepting terms and conditions in writing – I ask people to do the latter, but will create a formal contract if one or other of us thinks it’s necessary. Make sure you read all the terms and conditions carefully and ask about any you’re not sure of. Maybe paying a deposit in advance if your editor requires it. Now, most editors and proofreaders understand that the date you think you’re going to have your work completed isn’t always the date you’ll have it completed. Even if you think you’re ready, something might come up. If you’re using the booking to force yourself to finish the job (and there’s nothing wrong with doing that in principle!) then something might come up. The golden rule for me is: it’s fine if you get delayed, as long as you let me know. If you’ve booked to send your work to your editor next Monday and it’s Friday and you’ve not finished, then let them know. Preferably let them know before that, so they can book another job into the space. Let them know when you think you’ll be ready, and update them. As I mentioned above, most editors have more than one job going on at the same time, so it should be possible for your editor to shuffle work around to leave your slot open in a week’s time, say. However, if you don’t let them know and don’t keep them informed, then suddenly expect them to edit 100,000 words for you with no notice and a month late, they simply might not have the time in their schedule to do that! Don’t miss your slot: if you get delayed, let your editor know as soon as you can. This article has given you, the author or writer, some hints on negotiating with editors and getting your job booked in with them. Everyone works slightly differently, so I’ve tried to keep this as general as possible, and based it on my own practices. If you’ve found this article useful, do please comment and share using the buttons below! Thank you! Working with an editor 1: How do I request a quote? Do I need editing or proofreading? What is a style sheet? On completion of your edit, will my manuscript be ready for publication? A large number of people get in touch with me every week to ask for a quote for editing or proofreading. I’ve put together these guidelines for contacting me for a price and turnaround quote, but it would apply to most editors and proofreaders I know, with a few tweaks here and there. Sending me all this information in one go won’t give you a price decrease or a quicker turnaround if we end up making an agreement, but it will make the process easier and quicker – for both of us. 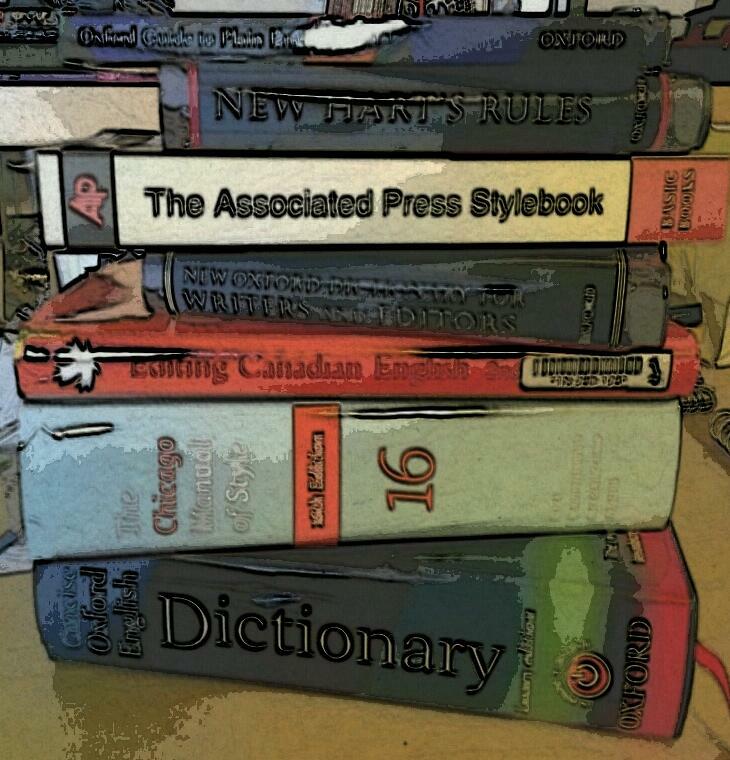 What does your prospective editor need to know? Is the material a book or something else (a website, advertising material, etc.)? If it’s a book, is it fiction or non-fiction? How long is the book – in words? Is it finished and ready for editing yet? When will you need it back from me? Why does your editor need this information? I think that any editor would give the same answers. Good editors and proofreaders get booked up quickly. If you have any idea of when your book will be ready for editing, start looking around for editors then, not a week before you want to put it out there. For one thing, once you’ve had your book edited, that doesn’t mean it’s immediately ready for publication (see this article on that topic). For another thing, your editor is likely to have other projects going on and will need to slot you into their schedule. The further in advance you ask them, the more likely they are to be able to fit you in. I will never mind a vague estimate for a few months’ time, followed up by a firming-up process when we agree when the manuscript will arrive with me and when I’ll return it. A last-minute request might work, but it’s much better and likely to be successful if you plan in advance. Quick check: what service do I need? This is typically done in Word with Track Changes turned on. Substantive editing includes all of this plus suggestions on major changes to the format, ordering and content of the book. This article has explained what information I need in order to provide a price and time turnaround quotation for editing your book. Other editors might need other information, and I’d love them to let me know if that’s the case. Hopefully this will make the process smoother for the author and the editor in those early stages of creating our arrangement. Read the next article in this series: How do I negotiate with an editor and book my project in? How do I negotiate with an editor and book my project in? This year so far, I’ve worked on, among other things, a book about Black history in the UK, incorporating a number of responses in prose, poetry and rap which reflected the spoken norms of inner city youth; a project about (very) experimental architecture; and a book giving advice to gay men on dating and relationships. I’ve transcribed interviews with bands I know nothing about, and I’ve localised texts about items I’m never going to use. As a straight, white woman who is not an experimental architect, doesn’t follow those bands and is unlikely to use a remote-controlled helicopter, should I have engaged with these texts where I was quite clearly the “Other” in the relationship or knew little about the topic? Or should I stick very closely to what I know? I think it’s fine to edit and otherwise work on texts that are outside your direct experience, as long as you’re flexible, keep the audience in mind, are willing to learn and keep an open mind. I also think that there are limits to what you can work on, and I’ll talk about that, too. It’s my personal opinion that it’s OK to edit texts that are outside your direct experience, as long as you bear a few things in mind. Think of the audience. What will the readers of this book want? Is the relaxed style with all the I’d and should’ve contractions something that they will feel more comfortable with? Leave those in. If you’ve got a good amount of life experience and a solid general knowledge, that will see you a long way into an unfamiliar topic. The good editors I know are wise in knowing what they don’t know and seeking to expand their knowledge. They love to learn. What teaches you more than grubbing around in the very innards of a text on something you never even knew existed? There are other positives, too. By approaching the text as the “Other” (while retaining a sensible approach to the privileges you might have as someone who is not usually the “other”), you might be able to suggest subtleties or pick up on attitudes that are going too far the other way. Maybe you can help reassure an author and their readers that people outside the core audience DO understand / empathise. More importantly and commonly, the aim of all writing should be to be clear and express its author’s intentions clearly. So if you, as an outsider, don’t understand the text, maybe it does need to be simplified a little. If I don’t understand something on the second or third go, I’ll pop a comment in the margin that this might need to be clarified. I think I have a tendency to edit better and more carefully when I’m working on something slightly unfamiliar. It’s like editing your own writing: if you really know the topic, you tend to see what you expect to read, and may skim over errors. I know I have this propensity, so I work extra hard on texts on known topics, and try not to enjoy the process too much at the expense of doing a good job! You learn all sorts of things that might be useful in your everyday life, the next thing you edit, or even pub quizzes. Your next client will benefit from that extra knowledge (or maybe the one after that – I edited a load of texts on Agile working a few months ago, so can cheerfully say I know all about it when another prospective text comes in). A book all about optimising your motor vehicle engine use, with lots of diagrams and examples. I know nothing about this, and there was little value I could add to something so technical. A localisation job where I would have had to research European legislation on a topic I knew little about to start off with, and match it up to US legislation. That’s too dangerous to mess with. Editing novels in genres I am not familiar with myself such as romance and science fiction – you do need to know your genres if a book is to be edited to fit into them. I’ve actually pretty well stopped working on fiction apart from the odd thriller for an on-going client, as they are pretty well all in genres where I know someone else will do a better job. Specialised transcription – medical and legal in particular. I’ll cheerfully type about makeup I don’t wear or economic policy that can be checked easily, but I don’t go near the specialised terminology used in medical and legal transcription. In summary … in my opinion, it’s good to stretch the boundaries of the areas you work on and to edit and otherwise work with texts on topics that are unfamiliar, unless the level of technical or specialist content is high enough that you are floundering and uncomprehending. In that case, there’s always someone who knows more about the topic that you can pass it on to. Happy learning! A little while ago, I wrote an article explaining what a style sheet was, mainly for my own clients, so I could send them a link when I sent their completed work and style sheet to them. It struck me, though, that it might be useful to write about style sheets from the perspective of the editor / proofreader as well (I’m going to use “editor” to refer to both here, for simplicity, unless I’m distinguishing between the two). I assume this will primarily be useful for people new to editing who are picking up tips from those of us who have been in the game a little longer. But whoever you are and however long you’ve been editing, do pop a comment below if you have anything to contribute! 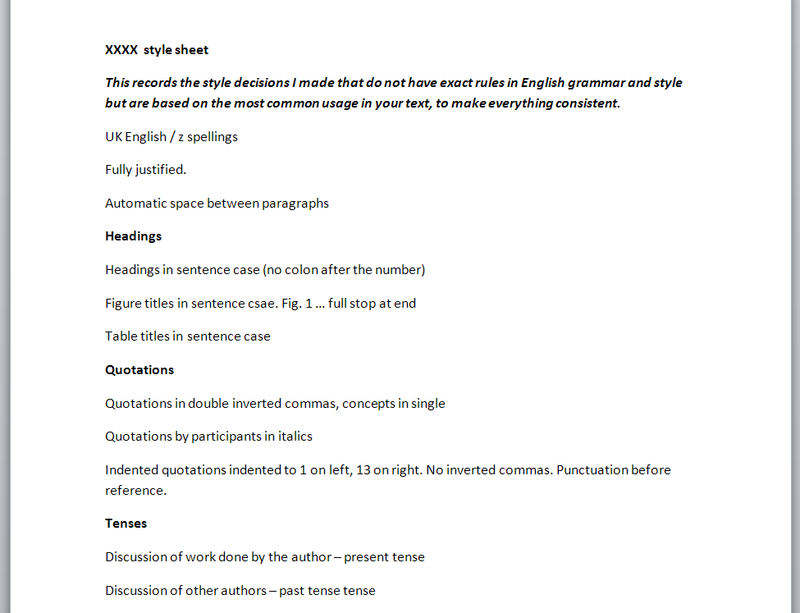 A style sheet is a list which spells out how things are to be done when writing and/or editing a text, including information on spellings, hyphenation and capitalisation, referencing and special information. Its aim is to keep texts consistent. Style sheets you receive from someone earlier in the process or general ones prepared by particular publishers, journals, etc. All three types serve the same purpose: to record the style decisions (more on this later) that have been made in order to keep the look, feel and detail of the text or texts consistent. When you’re creating a style sheet, it might only be for a single use, for a single client (e.g. a PhD student). 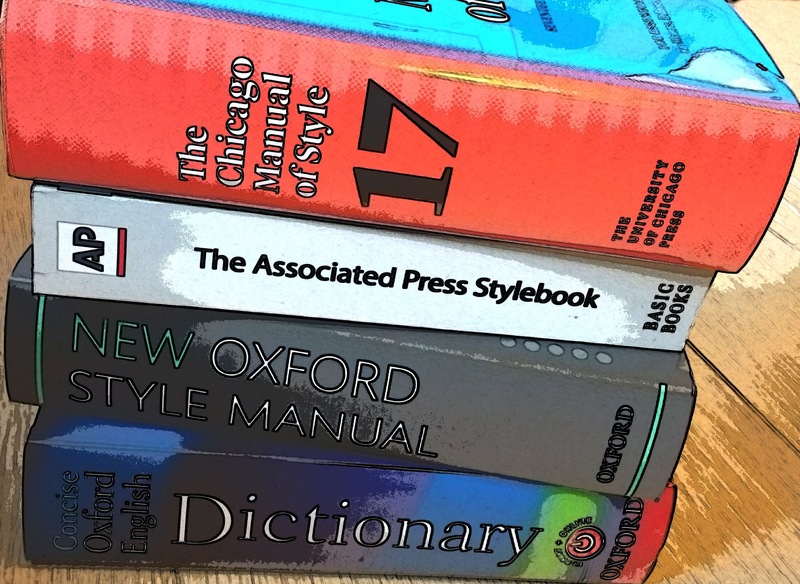 When one is created by a journal or publisher, it’s usually so that their “house style” will be consistent across publications and journal issues. But the idea is the same: it’s a tool that’s used to keep things consistent. What do you mean by “style decisions”? English is a funny old language. Even if you’re adhering strictly to one of the major style guides, (Chicago Manual of Style, Oxford Style, etc. ), you will find there is still room for choice in some aspect of your text. An example where even Oxford didn’t tell me what to do: I was editing a set of articles which included lots and lots of words and phrases in a different language to English. Each then had the English translation in some form before or after the foreign word. Of course, the articles were all written by different people who had used different ways to express this (word in italics / non-italics / double or single quotation marks and English in parentheses or not, italics or not, quotation marks or not). I was looking to make this consistent … but after some rules on what to do, Oxford told me to choose a way I did this as long as it was consistent! There will also often be individual names, phrases, etc. in the text you’re editing which will need to be set out in a consistent way, which might not have rules. An example where there can’t be any rules: your client has lots of interviewees and they’ve referred to them with a code to ensure anonymity. Do they put Respondent OH1, just OH1, OH-1, (OH1), [OH1], etc., etc.? Although a client a while ago said that his first editor “kept it all in his head”, I prefer to note all of this down so I have it to refer to and keep things consistent. What does a style sheet look like? I’m sharing here an example of one of my own style sheets. Note that I have a little explanatory note at the top to explain what it is. 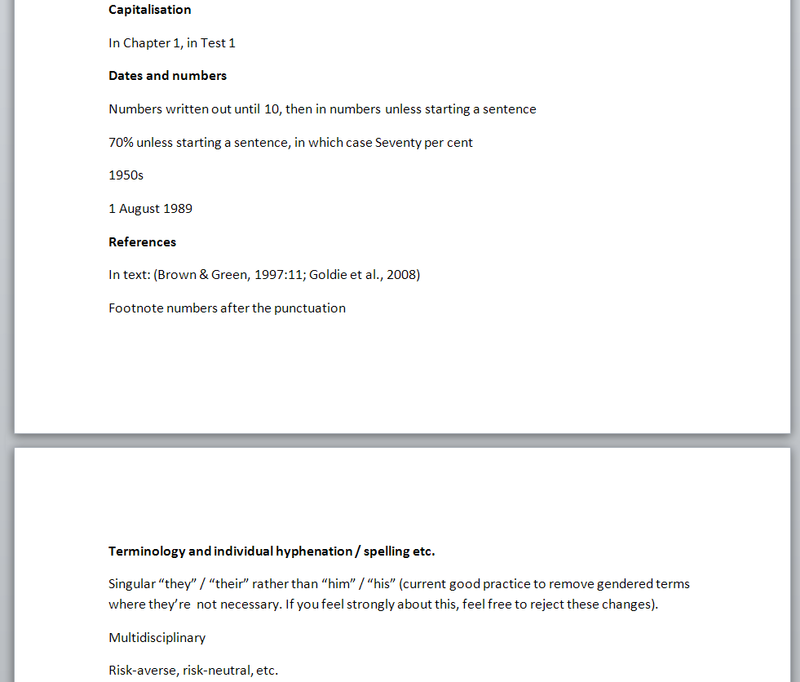 You can see that I set out the most common things that can differ (in my experience) and need noting down – s or z spellings, how the paragraphs are set out, how the headings and figure / table titles are set out, etc. In the second half, I go on to dates and numbers, how references are laid out, and some specific things to do with the particular text I’m working on. I find that a publisher’s style sheet is set out in the same way, although it might sometimes be online or a pdf with links. If I’m working on a text destined for a particular publisher or journal article, if their own style sheet is very long and my text is quite simple and doesn’t need all that detail, I’ll often summarise the parts I need on my sheet anyway. When should I set up a style sheet? When and why should I send a style sheet to my client? I pretty well always send the style sheet to my client along with my completed work. I typically send it with a note in the email directing the client to my explanatory article, as I’ve found that most of my clients haven’t come across this before (I happen to work with a lot of students and self-publishers, as well as translation agencies; your experience may differ if you mainly work with publishers). Hopefully, having a style sheet from me will mean that the client will keep things more consistent in the future. I do also mention that they should send this on to their proofreader if they’re planning to use one in the next stage of publication. This saves their proofreader from busily changing all the Chapter Ones to chapter 1 (or at least it explains that it was an active, considered choice on my part, and not an error). If I send my style sheet to my client mid-way through a project, for example with their first PhD chapter, I ask them to look through it carefully and let me know if there’s anything they’d like to change or they’re not happy with. Sometimes in this case I ask them questions (e.g. “You’ve used ‘Interviewee RD1’ and ‘RD1’ in equal numbers in your text; which one would you prefer to use throughout it?”). If they give me feedback, I record that, or if they ask to change something and their change does actually defy a stated grammar rule I will explain why I can’t. If the text I’m working on is destined for a publisher or journal that has a full style sheet, I will of course obey that to the letter, to make things as easy as possible for the in-house editor or designer. Even if that means leaving footnote numbers before the punctuation, something I don’t like to do (but some publishers prefer). If I’m proofreading a text that someone else has already edited, or I’m working on for example corrections in a PhD that someone else has worked on, I will use their style sheet to guide the changes I make. Even if I don’t approve of their decisions personally, as long as they don’t defy a rule of grammar, I’ll keep it consistent (even if I have to move a footnote number to before the punctuation!). I aim to make as few changes as I can at the proofreading stage, in order to keep corrections (and the chance of new mistakes creeping in) to a minimum. I hope this post has been helpful and given you some more information about why we use style sheets, where they come from, setting up your own one and working with your style sheet with your clients. Do pop a comment at the bottom or like and share this article if you’ve found it useful and interesting!